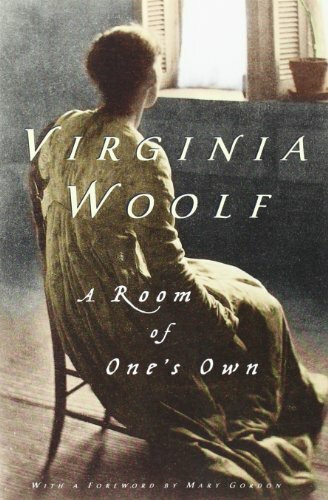 As both an English major and a woman, Virginia Woolf’s A Room of One’s Own is considered in my respective circles to be something of a starter Feminist Bible. In it, Woolf suggests that a woman who wishes to write must have a room of her own, which is just a way of saying that she needs a personal physical space and the financial independence to obtain it. Because majoring in English means I’m also a frequenter of libraries and coffee shops, I find the literal idea of a room of one’s own to be increasingly attractive: there is a sense of paranoid intimacy in writing beside another person, even if there is no realistic chance they steal a curious look. Lately, perhaps because it’s been well over a year since I had a room to myself, I’ve been thinking that this sense is exacerbated within the context of an emotionally intimate relationship (an infatuation or idolization, more specifically) which is in itself a manifestation of paranoid intimacy. Embarking on any sort of emotional attachment is like writing a short story in the front of row of a lecture: stressful, absorbing, and exhibitionist. The writing advice cliché that goes ignored by Starbucks Poets urges us not to write in public because humans subconsciously absorb the presence of those around them and consequently censor themselves. If this is true then the brain of an infatuated human is an over-capacity Starbucks whose patrons we are obsessed with not only intellectually but also emotionally. And a writer compromised on both those accounts cannot be a writer at all. So maybe it’s a logical jump from considering relationship and creative aspirations to Virginia Woolf. While Woolf’s argument is based more on the necessity of financial independence for uninhibited creative pursuits, I find it hard to believe that physical space is the sole ingredient in the cultivation of thought processes free from perceived outside judgment. Solitude and individuality are increasingly hard to come by, and because of this the argument that originality is dead and free thinking nonexistent becomes more and more difficult to refute with every retweeted meme. While economic freedoms are less of a roadblock in female creative pursuits now than they were in the Victorian era, the influence of an emotional relationship (be that romantic, familial, or even idolatry) exists nonetheless. In the case of the modern day, it exists perpetually. We are unendingly connected to those around us, embarking on relationships both anonymous and intimate, and as such we are stuck in a world in which our most private musings are tainted by all the available interactions to be had at any moment. We cannot escape influence by maintaining physical space anymore. Thus the need for a room of one’s own is a singular aspect in the search for uncensored work. More accurately, a woman in want of creative freedoms must not be in possession of a defining emotional attachment, and therefore she retains both the mental and physical freedoms to create unboundedly. My reasoning for this does fall rather closely along Woolf’s narrative of the gendered reality of literary history. It’s a fact that men and women retain different and sometimes conflicting places within our society; a patriarchy can only exist if the female party is subdued. And because the best act of oppression is censorship, the works and recognition of both genders within academia and the arts hold obvious disparities. Thus, when men write in the presence (literally or mentally) of the objects of their affections they do so without censorship, because man was meant to be loud and righteous. When women write in notebooks it is deemed a “diary” (an unnecessarily stigmatized term) and so those scrawls are hidden away. It’s much the same for students who finish Infinite Jest or Ulysses over the summer and subsequently write messily with footnotes instead of punctuation. We show the world what we believe the world wishes to see, and our worlds are comprised of the people and ideologies we value. Because of this it’s impossible to create anything of our own volition when infatuated with another being (the actual status of that relationship — be it fictitious in the case of the bro’s admiration of David Foster Wallace or real in the case of an engrossing romantic relationship — is irrelevant). Simply put, when we begin to value the mind of another person over the instincts of our own, all the products of our own creation are ultimately sullied. The difference between these two examples, however, is that one is based on idolatry and the other on emotion. While the idolizer romanticizes the idol, it is a form of imitation. When the infatuated writes while considering the object of that adoration, she succumbs to an interpretation of an opinion and becomes a diluted version of herself. While I admit that I’m generalizing and it may be the same for many male writers, I’d argue that this is less of an issue for men because of the differences in socialization between genders. Women are taught to conform to fit the ideals of their beloveds, men are taught to best them. Writing and feeling cannot be untangled, and most often this is a positive relationship. I don’t deny that love and the idolatry of David Foster Wallace inform our creative pursuits, but I’ll argue that the student who clings to his appreciation of Wallace’s footnote cannot become the revolutionary of that device. Similarly, women cannot write candidly when they have a romantic interest texting them to hang out around maybe 8 or 9 PM. Therefore, while there exists an uncountable number of female writers who have generated outstanding works regardless of their attachments, I think there is some validity to Woolf’s idea. When Woolf discusses women as property of their husbands, she means this literally, in the Victorian manner of the rest cure and limited, ladylike mental exertion. While one hopes this ideology has now died out, the effect of the self-censorship still performed by women upon their own writing today is just as significant as the burgeoning writer recklessly running with Wallace’s footnotes or Joyce’s syntax. Rebecca Solnit writes in her revised introduction to Men Explain Things to Me that “mansplaining is not a universal flaw of the gender, just the intersection between overconfidence and cluelessness where some portion of that gender gets stuck.” Along that line I would argue that the proclivity for women to arrange their desires and opinions according to the whims of their male (and sometimes female) counterparts is not a universal flaw of the gender but a product of societal conditioning in which women are taught that confidence and knowledge should be reigned in and distributed with care. It is for this reason that a Jack Kerouac wasn’t a woman — a female writer who is reckless with words is a rare and unquantifiable force. Ultimately, the desire to predict one’s audience is a challenge for all artists, but when that audience becomes a specific figure (and notably, an unavoidable figure due to the pervasive nature of modern communication) the work is corrupted. Diluting one’s voice (the product itself of countless inspirations and influences) based on the preferences of an admired individual seems like a sin within the context of literary history, but it is a social and emotional dynamic which, I believe, woman are at a disadvantage in combatting. Kerouac wrote with no regard to his lovers; men, as a general rule, don’t write to be liked. So Virginia Woolf is still right in some respects insofar as literature is just as gendered as any sphere. Women are conditioned to be likable and demure: to be smart but subtle, passionate but restrained. And although this reality has changed with the feminist movement and sexual revolution — these generalizations cannot be said for many — the influence of this socialization upon the literary cannon is still significant. It is for this reason that originality and boldness among female writers should be embraced and facilitated. In the same way that we discourage young writers from putting on a David Foster Wallace facade, we should encourage women to cultivate a space free from not only societal convention but also the self-censorship that blooms from emotionally consuming relationships. While all of this is easier said than done, and Woolf’s hypothetical argument for financial independence didn’t immediately facilitate female emancipation, there is a significance in recognizing the existence of a burden. The first step is always admitting the societal problem. After that, more practically, the second step is to begin journaling in public with plenty of expletives, and finally to write in complete — mental, physical, and metaphysical — solitude. Nikki Shaner-Bradford is a sophomore at Barnard College, and Managing Editor of the Columbia Review.